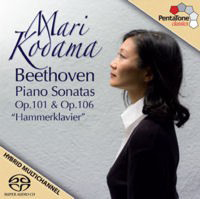 Beethoven: Piano Sonatas Nos 28 & 29 "Hammerklavier"
I commented on two earlier disks of Mari Kodama with growing interest and admiration for her interpretations of a number of Beethoven sonatas. 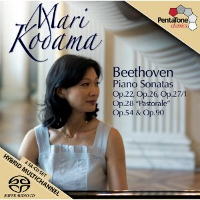 Now that she has reached the last installment I think it’s becoming that I turn to her once again to see how well she has brought to an end the immense task of a complete Beethoven piano sonatas cycle. 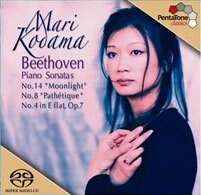 I shall not go back to all I have said in the past about Mari Kodama; her style, her feminine yet forceful ‘toucher’; neither will I comment on the recording, which, this time, is perhaps even a shade clearer, underlining once more its consistency and exceptional quality. 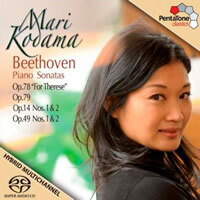 It is, furthermore, noteworthy that it has taken her some seven years to record all the 32 sonatas. This is a whole lot longer than the remarkable effort by the Korean, HJ Lim, recording them for EMI in only three months’ time. It would nonetheless seem to me that it takes more time to reflect upon these sonatas; time to really understand and come to grips with the structure, underlying meaning, vision and emotion. 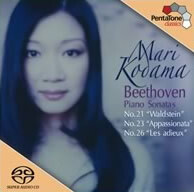 And there Kodama is in good company: Wilhelm Kempf, Alfred Brendel cs. also spread their cycles over a good number of years or did even more than one. In fact, it requires a life time experience for a deeply thought through cycle. 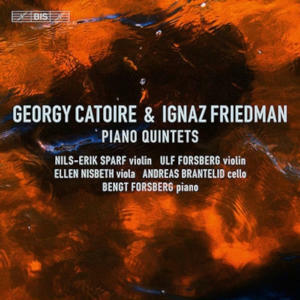 As for the ‘Die Hammerklavier’ sonata, for me the main work on this disk: It is not only difficult to play; it is also difficult to understand, and as such for the interpreter and listener alike. I, for one, would not recommend starting with this sonata for newcomers in this field. 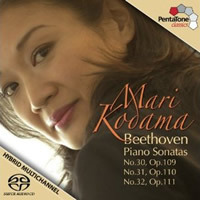 In that sense Kodama’s cycle has been well built: beginning with popular sonatas like the Pathetique and the Mondschein, followed by the Appassionata etc. (or the other way around, I don’t remember exactly), before finishing with the more inward looking, late sonatas, with their monumental character and innovative structure brought about by, yes indeed, a life time experience. These elements are, apart from all the technical qualities of the artist and the sound engineers, my yardstick to judge this final installment. As had already been the case with the previous volume: Sonatas Nos. 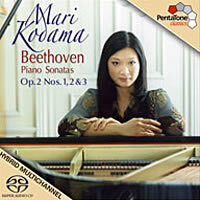 30, 31 & 32, one notes in opus 101 and 106 an increased insight in the way Kodama approaches Beethoven’s late sonatas. Over the years she has gone from strength to strength. Contemplation and mature vision have replaced virtuoso passage work. It seems to me as if she lets herself be guided by what she ‘sees’ in her mind, rather than what she hears with her ears. 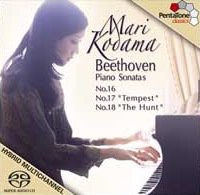 There is no false attempt to impress; she plays Beethoven as if she has become Beethoven (without, however, banging the keys as he did due to his growing deafness and subsequent angriness). She is in her own cloud and audience does no longer seem to matter. I had a feeling of being privileged to share these moments with her and all that I associate with true and genuine artistry. The heart of Op. 106 is no doubt the Adagio Sostenuto. Kodama’s is not as slow (almost 16 min.) as, for instance (and for a change), Rudolf Buchbinder’s (20 + min. 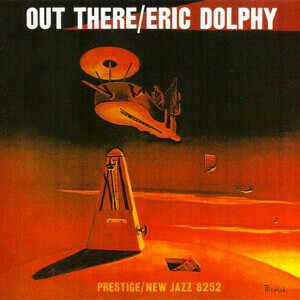 ), whose highly praised (The Gramophone) 1982 recording I took for comparison off my RBCD shelf. But she does not give the impression of being hurried at all. She just keeps the flow going with perhaps more ‘molto sostenuto’ and less resignation than Buchbinder. As I have said earlier, complete ‘female’ Beethoven cycles are rare. 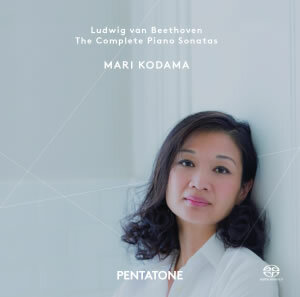 Some brilliant players, like Mitsuko Uchida (with an excellent recording of the ‘Hammerklavier’, by the way) did not record all of the sonatas; Lim’s show & speed performances may wear off quickly, as soon as the novelty has gone by. 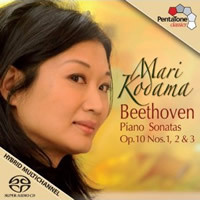 If you like delicate, contemplating, almost Schubert like, yet strong and powerful performances, Mari Kodama will not disappoint. On the contrary. 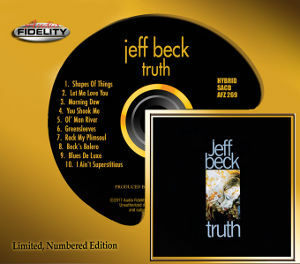 As for the cycle as a whole: I would not be surprised if this one were to become a top choice, and not only for those who appreciate a more feminine version, with as a not to be missed bonus a realistically glorious sound.